Lendlease officially opened the first stage of its $2.5b Melbourne Quarter mixed-use development this morning, with Minister for Planning Richard Wynne and Lendlease Group Chief Executive Officer and Managing Director Steve McCann on hand to open the group’s new Victorian home at One Melbourne Quarter. Located within the Batmans Hill precinct of Docklands, One Melbourne Quarter is home to approximately 400 Lendlease employees who have relocated from three different office locations across Melbourne. 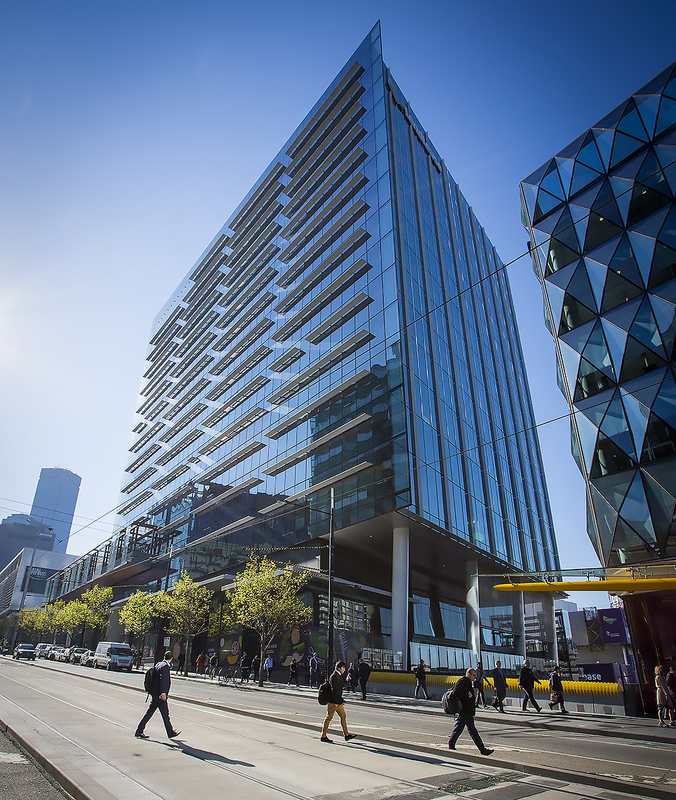 Lendlease occupies levels four to six of the 13-storey building, the first commercial tower to be delivered in the 2.5 hectare Melbourne Quarter precinct on Collins Street. 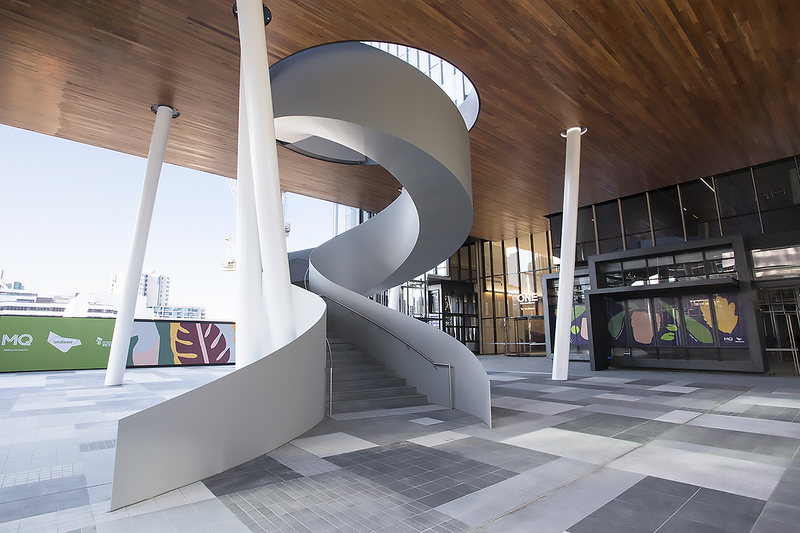 A key feature of the development is the first phase of the precinct’s elevated Sky Park, characterised by a feature sculptural spiral staircase providing access to the park from Collins Street. The second phase will be delivered as part of the future Melbourne Quarter Tower commercial development. The concept of the Sky Park was conceived by Denton Corker Marshall and developed in collaboration with ASPECT | OCULUS to improve health and well being. Based on principles of biophilic design, the elevated park comes complete with wifi and encourages workers to work outside and connect with nature. Lendlease’s new office tenancy is based on the concept of team neighbourhoods of 15 – 20 employees. Allocated desks are eliminated and replaced with centralised team tables to promote a team based working culture and opportunities for immediate feedback, staff connectivity and collaboration. Employees are free to choose how and where they work. Each neighbourhood has a range of spaces including ‘working walls’ for visual communication, enclosed meeting pods with access to virtual technology, breakaway areas for collaboration and services such as IT help desks on each floor to support high performance. The provision of a wellness hub reinforces the Lendlease's commitment to employee health and well being and offers discretionary nutrition options, wellness and lifestyle seminars, health checks and group training activities including yoga, pilates and bootcamp. Additional features include a dedicated event space, a high-tech immersion room, a social hub with a barista and interconnecting stairs across the three floors, promoting free movement and social connectivity. 2,500 workers will ultimately call One Melbourne Quarter home, with design and engineering firm Arup joining Lendlease in moving in, with AMP due to move in early next year. The building is targeting a 6 Star Green Star rating from the Green Building Council of Australia, a 5.5 star NABERS Energy tenancy rating and a WELL New Interiors Certification. 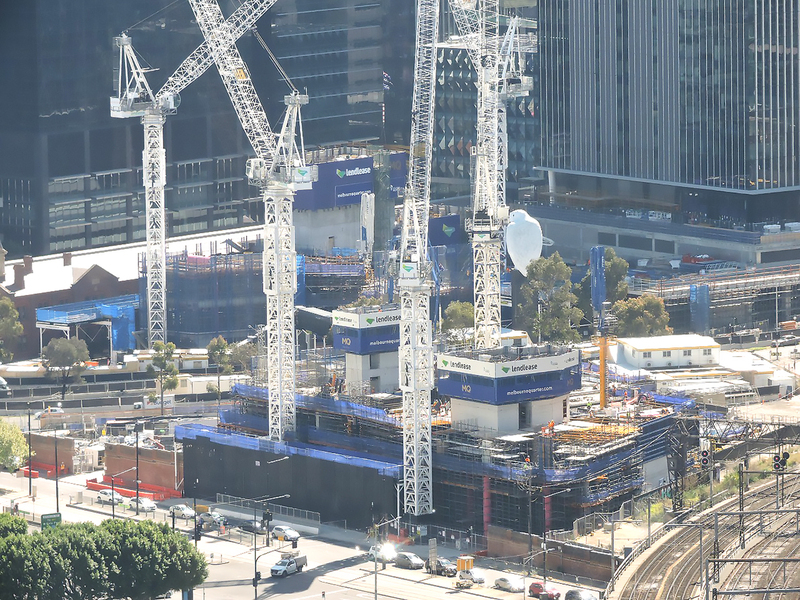 Meanwhile, work continues at pace on Lendlease's two construction sites within Melbourne Quarter - Two Melbourne Quarter and East Tower. Due for completion in mid-2020, Two Melbourne Quarter will comprise 50,000 sqm of A-Grade commercial space with EnergyAustralia secured as the anchor tenant. Melbourne Quarter has achieved a 6 Star Green Star Communities rating, showcasing world leadership in sustainability and upon completion 50 per cent of the Melbourne Quarter's development footprint will be dedicated to public open space. A central plaza and neighbourhood park designed by ASPECT | OCULUS, will join the already completed Sky Park. One Melbourne Quarter is active demonstration of Lendlease’s integrated model – delivering a workplace that is owned by a Lendlease-managed fund, built by our building business, in a precinct transformed by our urban regeneration business. Bringing our Melbourne workforce together in one central location means we’ll be more accessible to our customers while championing excellence, wellbeing and innovation. Based on the workplace strategies implemented at our global headquarters in Barangaroo, our new Melbourne location demonstrates greener and healthier ways of working. This creates a workplace that lives and breathes a culture of collaboration and purposeful interactions, providing employees with a sense of belonging. Moving into One Melbourne Quarter cements our bricks and mortar commitment to the precinct, while demonstrating our belief in our capacity to create the best places for our employees, customers, the environment and the community. The opening of Melbourne’s first Sky Park at Melbourne Quarter has brought an exciting new green public space to the city for residents, visitors and thousands of Victorians who work nearby. I want to congratulate Lendlease on its commitment to this bold project, which represents a long-term commercial and residential investment in the area. The Melbourne Quarter precinct creates an important gateway, linking Docklands to the CBD, creating thousands of jobs for Victorians both during construction and once complete.This is a place where Melburnians will want to visit, live and work.